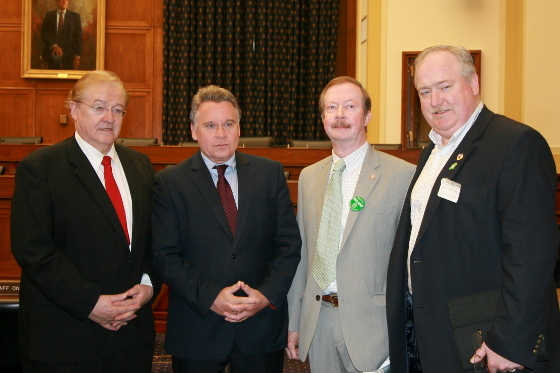 The U.S. House of Representatives Committee on Foreign Affairs convened a subcommittee hearing on May 15, 2013 to review recent developments in the investigation of the murder of human rights attorney, Patrick Finucane. The subcommittee was chaired by Representative Chris Smith (R-NJ). NJAOH Political Action Chairman Mike Glass and NJAOH President Sean Pender were present at this hearing. The committee heard testimony from Michael Finucane, eldest son of the murdered Pat Finuncane as well as Retired Brigadier General James Cullen. Mr Finuncane testified concerning the deficiencies and omissions of the past review made by Desmond de Silva. Gen Cullen offered testimony about a meeting that he had with an RUC agent who provided statements that the British Government was aware of the murder plan a week prior and had opportunity to stop the plot, but instead let the murder happen.